18-year-old Michael O’Connor is moving to Tallaght. O’Connor reportedly caught the interest of Bradford City. SHAMROCK ROVERS HAVE announced the signing of forward Michael O’Connor from League of Ireland rivals Dundalk. The Ireland U19 international, who had a spell with Bristol City earlier in his career, joined Dundalk in 2014, but has found first-team opportunities limited at Oriel Park – making just three league appearances last season. 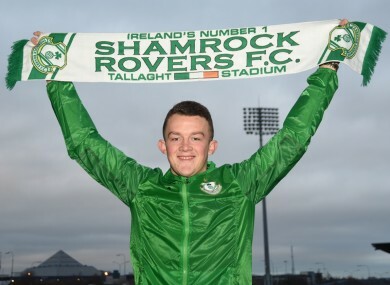 “We are delighted to have signed Michael [O’Connor], he is a very good young player and is eager to show everyone how good he really is,” Shamrock Rovers head coach Stephen Bradley said. O’Connor moves after an apparent switch to League One side Bradford City reportedly fell through for the young striker, but he will be joined in south Dublin by former Dundalk pair Ronan Finn and Darren Meenan, with the duo also making the switch to the Tallaght Stadium in the close season. “I am delighted to sign for Shamrock Rovers today,” O’Connor said. Earlier in the day, Irish Premiership leaders Crusaders confirmed the signing of defender Alan Keane from Stephen Kenny’s side, while Andy Boyle and Daryl Horgan departed for Preston last month. The League of Ireland season begins next month with a tasty fixture between Dundalk and Rovers at the home of the champions. Email “Shamrock Rovers capture highly-rated young striker from Dundalk”. Feedback on “Shamrock Rovers capture highly-rated young striker from Dundalk”.